We’d love your help. 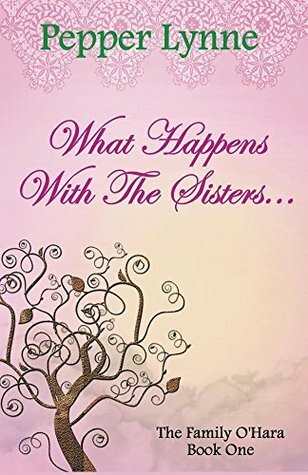 Let us know what’s wrong with this preview of What Happens With The Sisters... by Pepper Lynne. What do you get when you have a large, zany, pure Southern bred family? A family with eight children, all six daughters named after a flower, and "because we don't hide our crazy," an eccentric live-in Granny? Well, you get my family, the O'Hara's. While it’s not always easy being the second youngest O’Hara sister in this lively bunch, there is never a dull moment. In fact What do you get when you have a large, zany, pure Southern bred family? A family with eight children, all six daughters named after a flower, and "because we don't hide our crazy," an eccentric live-in Granny? Well, you get my family, the O'Hara's. While it’s not always easy being the second youngest O’Hara sister in this lively bunch, there is never a dull moment. In fact, more often than not, life within the O'Hara household is downright hilarious. From sitting down for Sunday dinners or heaven help us, listening to Granny B’s dating advice, the O'Hara family will not disappoint. To ask other readers questions about What Happens With The Sisters..., please sign up. Looking forward to the next book about these crazy sisters! Any idea when it will be released? Oh my goodness! If you read through the snippets just now, you know you are in for one heck of a good laugh when you read this book. It truly depicts our Southern roots and families and you will be entertained for hours with the stories in this book. Honest to goodness, you will laugh until you cry so you had better sit down with the box of Kleenex tissues before you even begin reading! I loved the book and if you love Southern humor, this is a good match for you. There were a few grammatical erro Oh my goodness! If you read through the snippets just now, you know you are in for one heck of a good laugh when you read this book. It truly depicts our Southern roots and families and you will be entertained for hours with the stories in this book. I loved the book and if you love Southern humor, this is a good match for you. There were a few grammatical errors in the book but they did not detract from the story. The writing is really good and funny. I am rating What Happens with the Sisters five stars.